For those of you entering the Wearable Art Fashion show this Friday, and for those of you wondering what wearable art is, this post goes out to some wearable art icons who can show you the way! “Wearable art” refers to clothing and jewelry that is intended to be viewed as unique and expressive art pieces. While pieces can be made of anything, many artists choose one type of material as their media. Let’s take a look at some specific artists and the material they use to define their wearable art. Beo Beyond is a German artist who specializes in paintings, costumes, and jewelry made of blacklight and other fluorescent materials. Sometimes, art must have a certain kind of lighting to look as the artist wants it to, but by choosing blacklights, Beo’s art creates its own lighting. The bright, neon colored lights, highlight special features of the model wearing them. Shadows cast by the lights also allow the artist to accentuate what he wants the viewer to see. Yup, blacklights were a really bright idea! One great aspect of wearable art is that artists can use it to make a statement. Australian based artist Marina DeBris combines her love of art with her social activism. 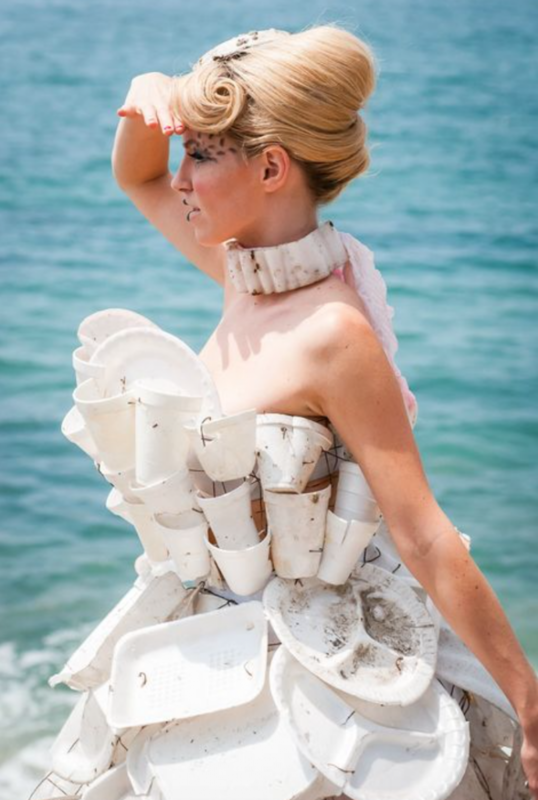 She creates her “Trashion” out of trash she finds on the beach. She uses her pieces to bring awareness to the public about ocean pollution, clean energy, and environmental public policy. Her work has set her, in the minds of many, alongside famous artists like Warhol, Lichtenstein, and Pollack. If your wearable art wins Best in Show, I’d say you’re “current”-ly on the road to fame. You may not have known this, but during the time span of 1930-1960, wearable art was a very popular concept. 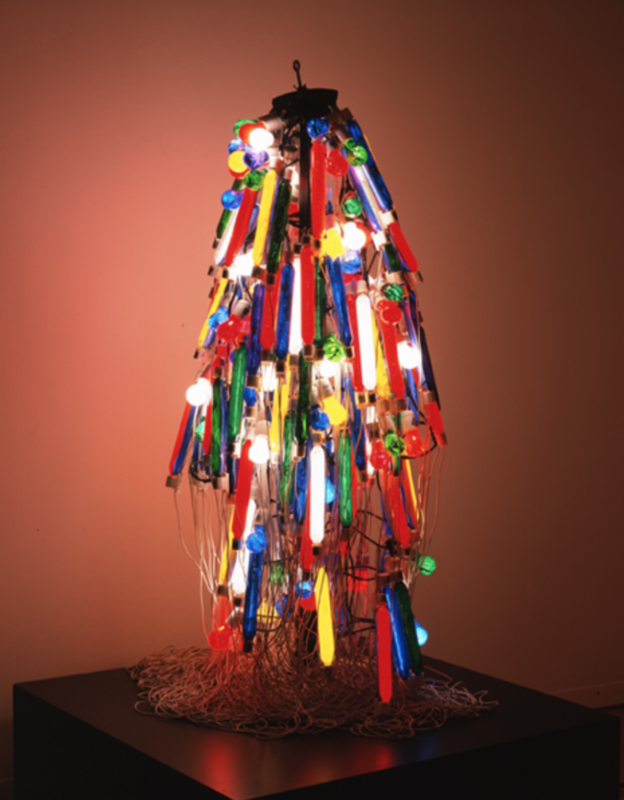 One of the most well-known examples from then is the Electric Dress, created by Japanese Gutai artist, Atsuko Tanaka in 1956. The piece consists of painted light bulbs, some electrified and some not, as well as a mesh of wires. Her piece resembles the circuitry of the human body, and according to other Gutai artists, symbolizes post-war Japan. Tanaka also stated that the Electric Dress was inspired by pharmaceutical signs lit up by neon lights, so you too can allow the wearable art fashion show to “light” the way for some of you inspiring artists. If we have learned anything from wearable art artists, it’s that you can combine many things into to one, whether that be art styles, objects, or talents. Continuing the theme, we have artist Nick Cave. This performance artist combines his fabric sculpting talents with dancing. He incorporates movement into showcasing his pieces. 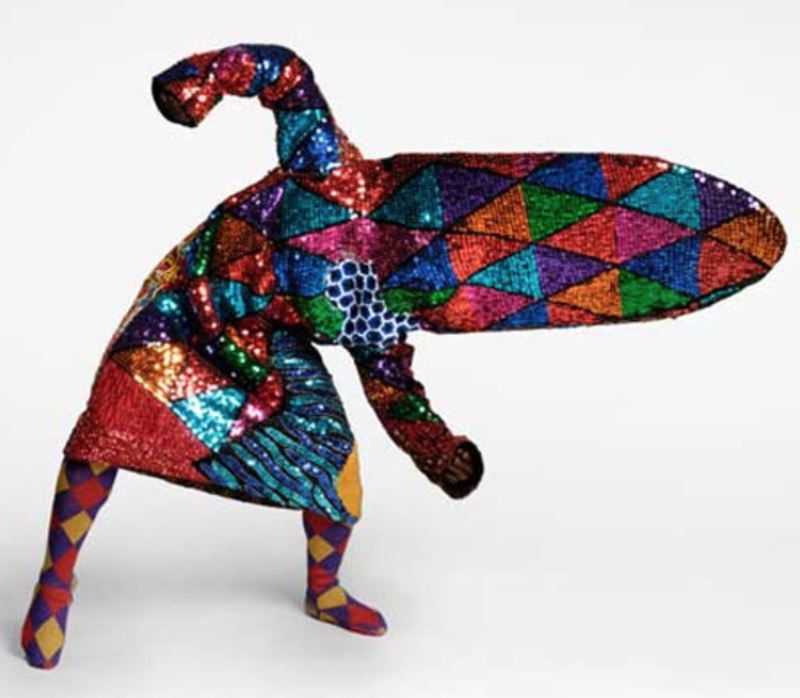 Due to the different textures he uses in the fabrics, his pieces create a noise as models dance. This brings his art to life, giving viewers a vibrant, and energized show that is somewhat like a masquerade. It’s a way to break free from the thinking “who made this” to rather “what is this piece saying.” “Hear” me out, this wearable art trend is really something! To see even more eccentric, unique, and inspiring pieces, come to the Wearable Art Fashion Show hosted by SUA on Friday, November 10th in the Kansas Union Ballroom from 6-8 pm. Come see who will be deemed Best in Show, 2nd Place, and 3rd Place. We are giving away over $400 in prizes! Free admission to the show for students and general public! ← Come Celebrate Día de los Muertos with SUA!